Buffalo Creek Park is the gateway to 1,500 acres of land conserved by the Carolina Mountain Land Conservancy on Weed Patch Mountain that protects the northern headwaters of Lake Lure in Hickory Nut Gorge. The town of Lake Lure has since purchased 200 acres for the creation of Buffalo Creek Park and a network of hiking and mountain biking trails. When fully developed, it will offer more than 10 miles of intermediate to advanced trails and picnic facilities along Buffalo Creek and on to the conservation easement. The new multi-purpose trail has three sections: The Head, the Heart and the Tail (HHT). After a brief warmup, it’s up the hill you go, eventually gaining roughly 500 feet of elevation. There is then a smooth traverse in the middle section that takes you through a large boulder field. Finish with a fast, flowing descent on banked switchbacks. I hiked the Buffalo Creek Loop on Tuesday, November 25, 2014 between 10:30AM and 12:45PM. My plan was simply to check out this new trail. Hike Rating: Moderate. There is some steep uphill, but not for long distances. Trail Condition: New and raw. This is primarily a mountain biking trail. Starting Point: Buffalo Creek Park on Buffalo Creek Road. Trail Traffic: I encountered five other hikers on this community trail. How to Get There: From Lake Lure Inn and Spa take Hwy 64/74A south for 6 miles until you reach Bill’s Creek Road on your left. Turn left and go 2 miles to Buffalo Creek Road. Turn left and follow this road as it passes the golf courses and condominiums of the Fairfield community for 2.3 miles. Turn right at the sign for Rumbling Bald Resort and Wyndham at Fairfield Mountains, cross the small bridge, continue for 1.6 miles. The park entrance will be on the left. 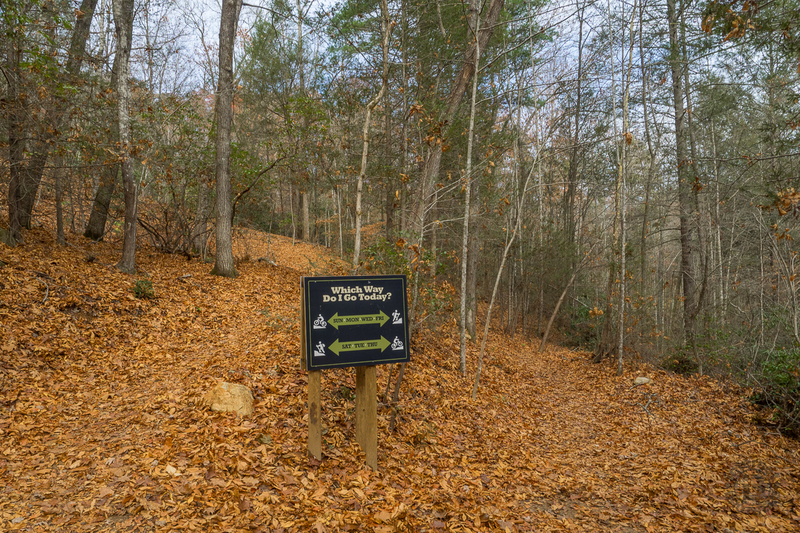 First opened in Spring 2014, Buffalo Creek Park is the latest addition to the ever-growing trail system in Hickory Nut Gorge. Soon, it will be extended by 7-10 miles through rugged backcountry to state park property at Eagle Rock near Shumont Mountain, ascending another 2,000 feet to reach high ridge lines and scenic viewpoints. This planned trail will eventually connect with Chimney Rock State Park on the north side of Rumbling Bald Mountain, itself a popular hiking, climbing, and mountain biking destination. A bike-accessible circuit of the entire northern valley is in the master plan, along with an extended thru-hiking experience that will circumnavigate Lake Lure in a 30-40 mile trail that summits several surrounding peaks. Sounds exciting, doesn’t it? Well, you will have to be patient. All that will take lots of time and money. You can do your part to help by joining, or donating to local land conservancies, and by becoming a trail maintenance volunteer. A good place to start is this overview of North Carolina land trusts, and this map to help you find one near you. If you love the outdoors, participating in conservation efforts can be quite rewarding. I’ve been to the Buffalo Creek area many times before. Golf is my 2nd hobby, and there are two marvelous courses here called Apple Valley and Bald Mountain. You pass them on the way to the trailhead. Upon arrival at Buffalo Creek Park, you will see two large sign boards, one with a map of the park, and the other with various rules and regulations. There is enough parking for half a dozen vehicles. The trail starts out in a southerly direction, following Buffalo Creek. Soon, it crosses the creek on a very well made foot bridge and approaches a trail junction. That’s the photo at the top of this post. If you continue straight ahead, there is a nice picnic area along the creek, and an alternate access to the park for the residents of the Rumbling Bald resort community. To the right, and up the hill, is the trail for this hike. There are more wooden plank foot bridges over mountain streams, and then the trail comes to a fork where the actual loop begins. Something unique here that I really like — for the safety of hikers and bikers — they alternate the direction that you proceed around the loop. Sunday, Monday, Wednesday and Friday mountain bikers will go left and pedestrians will go right (counter-clockwise), and on Saturday, Tuesday and Thursday, pedestrians will go left (clockwise) and mountain bikers will go right. This is to prevent downhill bikers from overtaking slower hikers in the same direction creating a hazardous condition. Hikers and mountain bikers always proceed in opposite directions so they can see each other on approach. Alternating days of the week, the direction reverses. This is a thoughtful safety feature of Buffalo Creek Park. No matter the direction, the loop zigzags like a tangle of ribbon up the mountainside. While it ascends fairly steep terrain, the abundance of switchbacks enables a constant moderate grade. When you are on the trail, it becomes pretty obvious that it was designed for mountain biking. Many of the switchbacks are banked for bikers, and you will notice several rollers — man-made bumps for jumping. Still, there is not a thing wrong with walking. I was fortunate to take my first pass around the loop with all the leaves down, enabling me to see the surrounding terrain. There are several nice views of the cliffs on Youngs Mountains across the valley to the east. I imagined myself here in October amidst the Autumn brilliance. With the oak and hickory especially, I suspect this is a gorgeous trail. This also seems to be prime wildflower territory for Spring hiking. Speaking of hickory, I could certainly see how the gorge got its name. There were literally thousands of hickory nuts scattered all up and down the trail, at least in late November when I was there. Watch your step, or you’ll be roller-skating. Upon approaching the crest you enter the “Heart” section of the trail, fairly level and through a large boulder field. Some of the outcrops are as big as your house. Keep your eyes peeled for the rare Green Salamander that likes to wiggle in, out, and around cracks in the large rock. You may also see rock climbers who love to come to Hickory Nut Gorge for the various challenges. At the highest point, you’ll finally be able to catch a glimpse of Lake Lure itself through the trees… quite picturesque. Downhill is more of the same dense forest with lots and lots of switchbacks. I noticed some switch cane along the trail, usually more common down in South Carolina, but this area is very near the state line after all. Be wary too of the rolling hickory nuts, especially downhill. Actually, as many as there were, I’m kinda glad I wasn’t there a few weeks earlier when they were falling out of the trees. Might have needed a hard hat. If you are curious about the plans for Buffalo Creek Park, and beyond, check out the frequently asked questions on the Town of Lake Lure website. Dirt is moving for expansion even as you read this. The loop will eventually reach 5 miles. Then the trail will head west for an additional 5-7 miles to connect with state park property at Eagle Rock near Shumont Mountain. The town anticipates possibly adding some back country camping amenities to this leg. The map below is the GPS track I recorded during my hike clockwise around the loop. Enjoy the photo gallery below the map.